Irish law firm McCann FitzGerald has announced that it is the first legal practice to sign up for Courtsdesk, an Irish technology company that is making courts data accessible to businesses and the public. Courtsdesk is an online data service offering search, tracking and analysis of 593,000 Irish cases involving 1.3 million individual parties to date. Its archive, updated daily, includes all hearings of the Circuit Court since early 2017 and every case in the High Court since the 1950s. Sean Barton, McCann FitzGerald's Head of Dispute Resolution and Litigation, said, "Courtsdesk is an innovative tool that allows us to achieve best practice in assessing, tracking and managing litigation on behalf of our clients. He said the addition of Courtsdesk is an important offering for clients. 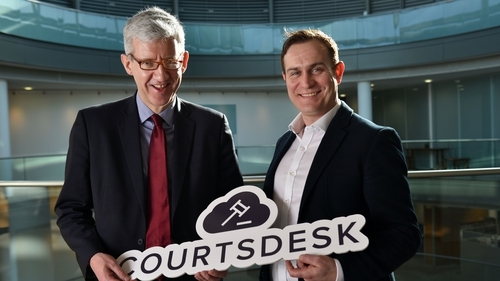 Courtsdesk co-founder and CEO Enda Leahy, said the company is trying to solve case management and research problems that legal and corporate organisations have had for years - for example the ability to automatically cross-reference the Companies Registration Office with the courts. He said Courtsdesk has opened up the Circuit Court for the first time - a hugely important set of records for Irish society which has never been searchable before. "Courtsdesk offers the first search, archive and case tracking system, with almost a year of cases already available," he said.